I'm pleased to announce Aqueduct Press's release, in both print and e-book editions, of Roadsouls, a novel by Betsy James. Roadsouls explores the power of art and creativity for transforming not only one’s own life but also the world one lives in. Timid Duuni has spent her life as abused and guarded property. Blind, arrogant Raím is determined to be again what he once was: hunter, lover, young lord of the earth. Desperate to escape their lives, the two lift up their hands to the passing Roadsoul caravan, and are—literally—flung together naked. Each of them soon learns that saying “yes” to the Roadsouls is more than just accepting an invitation to a new life—it’s a commitment that can’t be reversed. For Duuni and Raím, nothing is as it was. Lost to their old lives, hating each other, they are swept out of their cruel old certainties into an unknown, unknowable, ever-changing world of journey and carnival, artists and wrestlers and thieves. Behind them, inexorable, pads a lion. Inexorable, too, is Duuni and Raím’s inevitable encounter with it, an encounter that will change everything. In this subtle fantasy, James (Listening at the Gate) follows two wounded young people as they move toward (and sometimes away from) each other.... The blossoming of Duuni’s artistic talents and the gradual process of Raím working through his anger are sensitively depicted, and the book has the rhythms of the road—meetings, partings, and new landscapes every day—at its heart. The Roadsouls, and the novel as a whole, are...open to wonder: genuine transformations that just happen, without rituals or spells. ... Betsy James deliberately avoids the tropes and narratives typical of long fiction (mainstream, heroic fantasy, or romance). 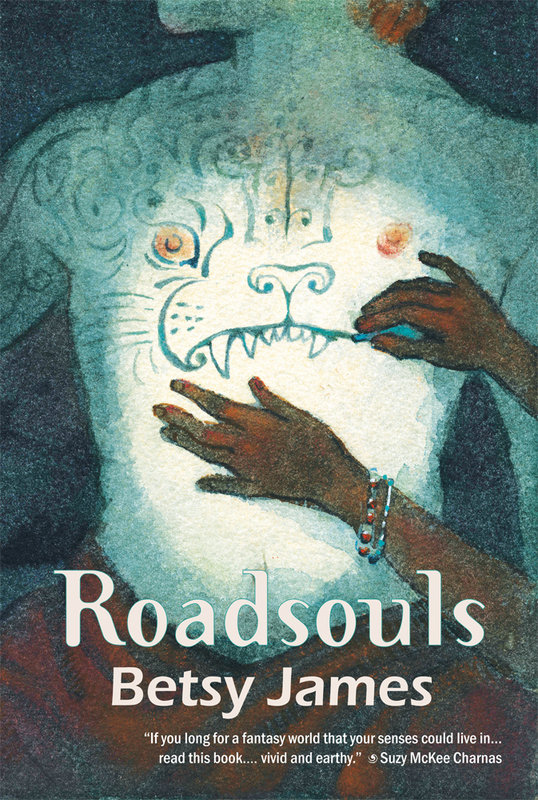 Roadsouls can be purchased from Aqueduct Press here.